Nigerian troops have repelled a Boko Haram attack near the village where 185 people were kidnapped last week, killing several insurgents, soldiers and witnesses said Saturday. Roughly 150 militants stormed the town of Bulabulin on Wednesday, but the military had reportedly received advanced warning of the raid. Bulabulin lies in the Damboa local government district of northeastern Borno state and is near the village of Gumsuri where 185 people, mostly women and children, were kidnapped last Sunday. “Our men climbed high electricity poles for surveillance and sighted (the insurgents) from afar,” said a senior officer who participated in the operation but requested anonymity. 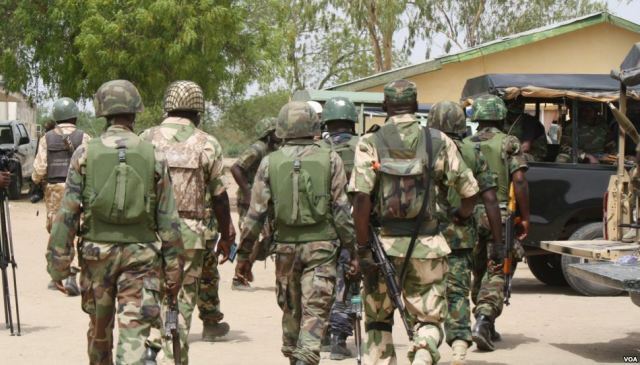 Defence spokesman Chris Olukolade said Friday that troops were battling Boko Haram fighters in the area, but was unavailable to give details on clashes in Bulabulin. Two security sources estimated that a large number of insurgents were killed by the military but there was no official toll. 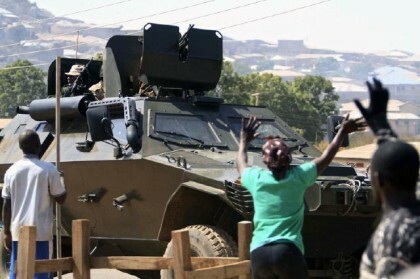 Resident Samuel James confirmed that the military overpowered the militants. “We would have been dead by now but the army really gave the terrorists a good fight,” he told Associated Press. Olukolade said reports of the mass kidnapping in Gumsuri needed to be verified but confirmed that Boko Haram had attacked the town, killing a number of civilians. Locals and officials said the hostages were carted away on trucks towards the Sambisa Forest, a notorious Islamist stronghold. Sambisa is also where more than 200 schoolgirls kidnapped in April were reportedly taken before being split into groups. Details of unrest in the northeast often take days to emerge because the mobile phone network in the region has mostly collapsed and many roads are impassable. 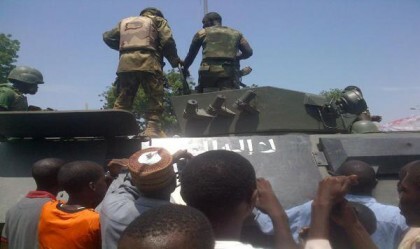 Separately, Boko Haram fighters attacked the town of Damagun in neighbouring Yobe state late Friday but caused no casualties, police and witnesses said. Scores of gunmen riding on motorcycles shot sporadically in the air and set fire to public buildings. The destroyed a police station, a fire station and local government buildings, said a police officer based in the area who requested anonymity. “Some of us ran into the bush while others shut themselves indoors,” said resident Grema Ahmad. Another local, Salisu Ibrahim, said he was surprised that the insurgents did not target civilians. “They made no attempt to pursue fleeing civilians or break into homes which they could have done if they had wanted to,” he told Associated Press. The Boko Haram conflict has claimed more than 13,000 lives since 2009.